Joseph Gilbert, longtime coach of Collin Altamirano and Jenson ‘J.T.’ Brooksby, was named as the 2018 Team USA Developmental Coach of the Year as part of USTA Player Development’s annual Team USA Coaching Awards. Lakes Tennis Academy in Frisco, Texas, was recognized as the 2018 Team USA Developmental Program of the Year, while USTA Southern California was named the 2018 Team USA Player Development Section of the Year. Renowned coach Jose Higueras was also honored with a Team USA Legendary Coach Award. 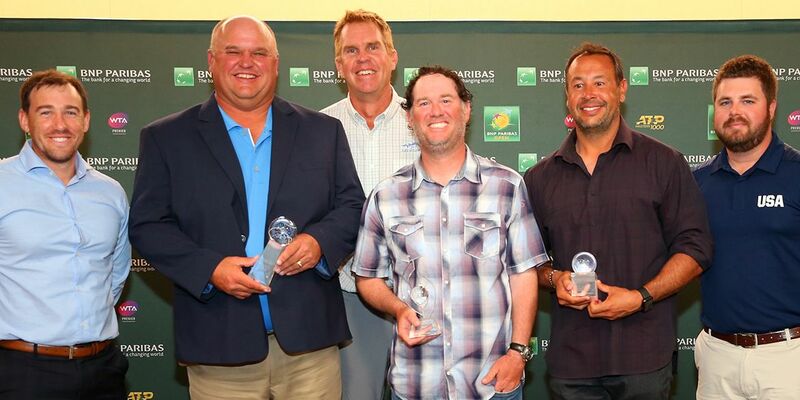 All honorees were recognized at a reception on Sunday at the adidas Easter Bowl junior tournament in Indian Wells, Calif.
Gilbert (pictured above, center with trophy), the owner and director of the JMG Tennis Academy at Arden Hills Athletic and Social Club in Sacramento, Calif., helped guide both Brooksby and Altamirano to new heights in 2018. Brooksby won the USTA Boys’ 18s National Championship and earned a wild card into the US Open on top of winning the Easter Bowl boys’ 18s singles title and reaching the junior semifinals at the US Open. Altamirano, a former USTA Boys’ 18s champ himself, reached a career-high ranking of No. 283 and qualified for the US Open main draw. Additionally, Gilbert coached Mason Nguyen and Ishaan Ravichander to USTA National Winter Championship boys’ 12s and 18s titles, respectively, while JMG’s Zach Lim took home the boys’ 16s title at the International Spring Championships. After being honored as the first Team USA Developmental Coach of the Year for 2013, Gilbert is the first two-time honoree. Read the full article at by clicking here.